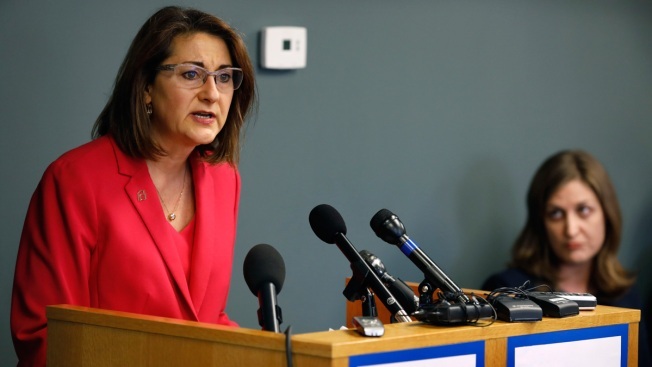 Planned Parenthood of the Heartland President and CEO Suzanna de Baca speaks during a news conference, Tuesday, May 15, 2018, in Des Moines, Iowa. After Planned Parenthood and the American Civil Liberties Union challenged the nation's most restrictive abortion law, an Iowa judge said he would issue a temporary injunction. The advocacy groups have sued the state to block the law, which bans most abortions if a fetal heartbeat can be detected. An attorney for the state says the goal is to quickly get the case before a judge to argue the law it's constitutional. Judge Michael Huppert said during a court hearing Friday that he'll issue a temporary injunction later in the day. Reynolds signed the law May 2, two days after lawmakers approved it.